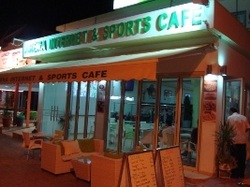 Arena Sports cafe is open all year round and is located on Ayias Mavris, the main strip in Ayia Napa. It serves breakfast lunch and dinner and a choice of snacks though the day. It also shows Cypriot and Greek sporting events. This venue suits all, you are as likely to see tourists tucking into an English breakfast as locals playing cards or tavli over a coffee. Asado restaurant was new in 2012 and is located on Nissi Avenue close to Sandy bay beach. This steakhouse offers a selection of Cypriot and international dishes and is open for lunch and dinner during the summer months. Athlos reggae bar is open for breakfast, lunch and dinner and serves snacks and main meals. Athlos is located just 5 minutes walk from the centre of Ayia Napa, opposite the Petrosana Apartments. 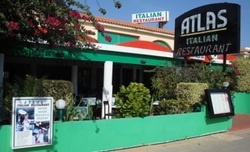 Atlas Italian restaurant is located on Nissi Avenue in the Nissi Bay area and is open for lunch and dinner throughout the summer months. Axartis restaurants is a traditional family run restauramnt located right opposite Waterworld Waterpark in the Macronissos Beach area, also close to Ayia Thekla. It is open int he summer months and offers Cypriot and international dishes. 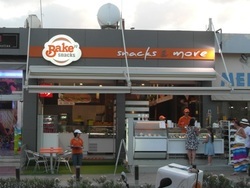 Bake N Snacks has 2 locations in Ayia Napa, one on Makarios Avenue, just by the traffic lights and another on Nissi Avenue. Both serve a selection of fresh baked pastries, made to order sandwiches and ice cream throughout the day and evening during the summer months. The Bakery Co was new in Ayia Napa for 2012 and offers a wide choice of snacks and refreshments, including pastries, sandwiches, ice cream and coffees. It is open during the summer months throughout the day and evening. Beach Club was new for 2013 and is part of the upmarket So White boutique Complex. Located right on Landa Beach, this exclusive venue offers lunch and dinner. catering for both informal dining and more intimate fine dining, this venue also has regular events and parties. 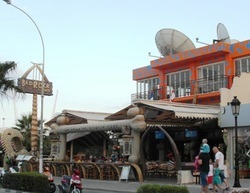 Bedrock cafe is centrally located on Nissi Avenue in the heart of Ayia Napa. It is open throughout the day and evening and serves breakfast, lunch and dinner. 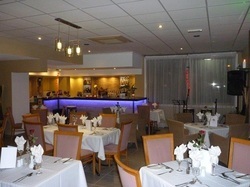 There are also singers and Karaoke in the evening and this is family friendly venue suitable for all ages. The menu comprises a selection of international and Cypriot dishes as well as snacks. 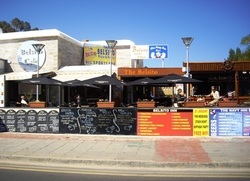 The Belsito is located on Nissi Avenue in the Nissi bay area and is open all year round. Offering breakfast, lunch and dinner, the menu contains local and international main meals and snacks. 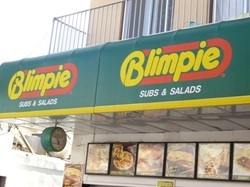 Blimpie is located next to Black N White club in the heart of Ayia Napa and is open late nights through to early mornings during the summer months. It serves subs, sandwiches and other fast food. Blueberries restaurant is a long standing favourite in Ayia Napa, located on a side road just a couple of minutes walk from the main strip, Ayias Mavris. It is open all year round and serves Cypriot and international cuisine. Bon Apetit is new for 2013 and is a late night snack venue right in the heart of Ayia Napa next to Club Sin. 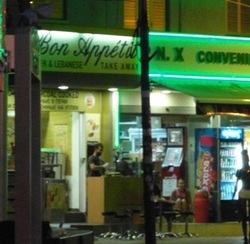 Bon Apetit serves Lebanese and Greek foods for takeaway. 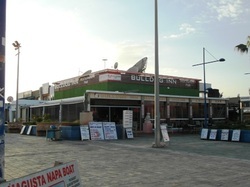 The Bulldog Inn is located at Ayia Napa harbour and is open all year round. It serves breakfast, lunch and dinner, as well as snacks, from an extensive menu including Cypriot and international dishes. It is also open for drinks though the day and into the night.